"This is a pulled pork BBQ that is sure to please everyone's taste. Best to use a slow cooker!" Place pork in a slow cooker and season to taste with garlic powder, poultry seasoning, salt, and pepper. Add quartered onion, apple, and 3 celery stalks. Pour chicken broth into slow cooker. Cook on Low until very tender, about 8 hours. Transfer pork to a large platter and discard juice and vegetables. Shred pork with a fork and return to the slow cooker. Prepare barbecue sauce while pork is cooking. Melt butter in a large saucepan or small Dutch oven over medium heat; cook and stir 2 cups celery and 1 1/2 cups onion until onion is translucent, about 5 minutes. Add ketchup, water, vinegar, brown sugar, Worcestershire sauce, mustard, liquid smoke, and 1 tablespoon garlic powder; mix. Reduce heat to low and simmer, stirring occasionally, until sauce is thickened, about 10 minutes. Pour barbecue sauce over shredded pork. Continue cooking pork on Low heat until flavors combine, about 2 hours. Made this according to directions and it was excellent! Made slaw and had BBQ sliders. Excellent ! Instead of throwing the broth away, I froze it for future use. Very good. Family loved it. I used a 2 1/2 lb. Pork loin and didn't have any celery, but followed the rest of the recipe as written. Served with buttered buns and seasoned Curly Fries. 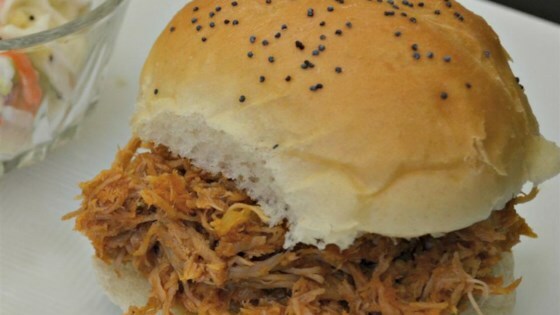 Best pulled pork, but I substituted the homemade bbq sauce with sweet baby rays. I didn't use all of the sauce, but it was very good! Made exactly as recipe is written and it was awesome! My husband said it reminded him of pulled pork his Grandmother used to make. Trying again w/sweet baby rays just to try as quicker option.